A remarkable celebration of Sacks's varied interests, told with his characteristic compassion and erudition, and in his luminous prose. From the bestselling author of Gratitude and On the Move, a final volume of essays that showcase Sacks's broad range of interests - from his passion for ferns, swimming, and horsetails, to his final case histories exploring schizophrenia, dementia, and Alzheimer's. Oliver Sacks, scientist and storyteller, is beloved by readers for his neurological case histories and his fascination and familiarity with human behavior at its most unexpected and unfamiliar. 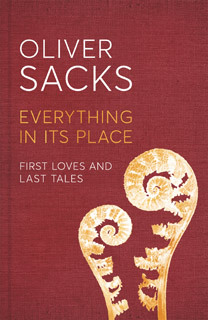 Everything in Its Place is a celebration of Sacks's myriad interests.